Provide comfort for the family of Leslie Barni with a meaningful gesture of sympathy. 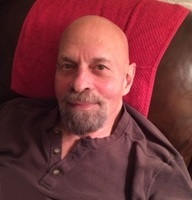 Leslie Bernard Barni, of Manhattan, was born August 7, 1945 to Leopoldino and Josephine Barni in Pittsburgh, PA, passed away Saturday March 30, 2019. Les grew up in Pittsburgh and graduated from Peabody High School where he was very proud of the fact that as an allstar linebacker he helped lead his team to a City Championship. His jersey number was 88. After graduating High School he enlisted in the US Navy where he served with the Air Anti-Submarine Squadron Twenty Two. One of his main jobs was changing tires on the fighter jets on the aircraft carriers. He has always spoken with a mixture of awe and pride about this part of his life. His job included riding shotgun in the aircraft so he would understand the importance of changing those tires. When he received an Honorable Discharge he went on to get a BA in Speech and Theater from Western Connecticut State University. There he found his love for theater and participated in many productions. This led him to New York City where he worked as a waiter, a bouncer, bartender (for many years at the Corner Bistro in the W Village) and various jobs to support his love of acting. Among his acting credits were principal work in a variety of SAG films, tv and industrials. He worked regionally in Barefoot in the Park, and other plays including The Price and The Time of Your Life. In 1982 Les moved to West Haven, CT, where he met his wife, Mary K Law. They fell in love and moved back to NY City together in 1985. They were married August 10, 1987 on Wellesley Island, NY where she was working with a theater company. Upon returning to NY he was inspired to pursue a teaching career and first assigned to a school in the South Bronx, Jane Addams Vocational High School, and later received a permanent assignment at NY High School for the Humanities, where he could walk to work and where his daughter Talulah would later attend Jr. High School! While teaching he earned his Masters degree in TESOL at Hunter College. He continued that education even after the degree. Leslie also participated in various theater workshops, most notably with the Manhattan Theater Club. These connections gave him great satisfactions. In 2001, after many years of marriage, Les and Mary made a decision that would change their lives forever, the adoption of their daughter Talulah. In 2010 Les retired from the New York City Board of Education. In retirement he loved telling people that he was able to walk Talulah to school and back every day. Things he loved: Pittsburgh Steelers, extended family and friends, his own personal reading program including novels and psychology (there are are composition books he has filled with his thoughts on each book), pizza, pepper, the ocean and Martha’s Vineyard every summer, long walks and playing the lottery. But above all he loved his wife, daughter and dog Benjamin. Les had many personal friends in the West Village and generously gave time to connect with them. Leslie is survived by his wife Mary Law; his daughter Talulah Barni; sister Anne Sossei (and her spouse William Sossei); nieces Emily Mancusi (and her spouse David Mancusi and their children Julia, Lillian, Wil, Catherine, Noelle, Owen and Violet); Diana Sossei; nephew Neil Barni (and his spouse Meghan and their children Olivia, Abigale and Tessa). I don’t remember much about my inner city Pittsburgh high school. Even though I got decent grades, the rest of it didn’t really matter to me. Hours of homework didn’t exist in those days and I used to take the day off every Friday. There’s one thing that stands out to me the most. This was winning the city championship on my high school football team. Growing up in Pittsburgh Pennsylvania, I was surrounded by many other Italians in my neighborhood. My father owned an Italian Grocery Store and my mother was a housewife. I worked in his store for 5 years and was paid 50 cents an hour, which to me, seemed like a lot of money at the time. It was hard physical work, which I didn’t mind, but didn’t love either. For me, it was boring and showed me exactly what I didn’t want to do for the rest of my life. I went to Duquesne college and decided to study Radio and T.V Journalism. After a year I dropped out and joined the Navy. I came back to study liberal arts and graduated from Western Connecticut State University. I then went to New York and graduated Hunter college graduate school. My first job after college was working as a bartender and waiter in New York from 1974 to 1984. It was a steady job for ten years, while having time for acting in between, but I realized that this wasn’t what I wanted to do forever. I saw an advertisement in the news about a teaching job, so I decided to apply. I’ve always loved the English language and have been an avid reader for years, but I never expected that I would continue to teach English for the next 27 years. As an ESL teacher, I met kids that came from 20 different countries which was a rich experience and enhanced my understanding of their cultures. I lived in the same apartment that I still own 40 years later and remember when the rent was only $327 a month. Since my wife and I didn’t have a lot of money, we weren’t able to shop or eat out often, but luckily she had acting jobs that allowed us to travel. We used to spend $20 a week on food which included a lot of pasta, rice, beans, instant milk and vegetables. Transitioning from my small town in Pittsburgh to New York City was challenging. From my father’s little Italian grocery to Bartending and teaching, I was able to meet people from all different backgrounds and ethnicities. I learned how to interact with all kinds of people which is a skill that has helped me throughout my life. My mother always wanted me to become a teacher and I didn’t want to in spite of her wishes. Looking back, I realize that she only wanted the best for me which is what I decided to choose. Consider providing a gift of comfort for the family of Leslie Barni by sending flowers. Les was an ever present encouraging voice with a warm soul, kind heart and a genuine enthusiasm and love for life. Les liked to look beneath the surface of things, find the true value therein, and joyfully share it with those around him. His words helped to guide many on their journey and his presence will be missed by all. To A Most Wonderful Man and Soul, I Will miss talking about the Steelers with you, may the angels be with you.